Here's the last eye I did before I started trying The Falsies mascara. I'm still confused by that mascara. I took pictures of eyes that I did with that mascara and they're almost too embarrassing to post... but I'll post them anyway because I liked the eyeshadow at least. Anyway. Green! Hmm... mattes don't really look all that great with flash, do they? Oh well. Velvet Moss looks like it's three different colors, that's weird. I didn't notice that while I was wearing it but photos sure picked up on it. Very typical look for me. Green and purple. I'm still trying to break out of my green/purple/silver/gold rut and use more blue and pink and other colors but when I'm in a hurry I always end up going with the old staples! Like today, I have on silvery taupe and black. Though I did see a fish in the fish tank at Whole Paycheck Foods that inspired me to try a blue and neon orange look... Maybe I'll try that soon. I can never get tired of your bright colors. You pair them up so well. Jealous! Faerie Glamour looks awesome as liner. I still need to nab a sample of Aztek Gold. Pretty! I actually love The Falsies! Mine isn't clumpy at all- it's very smooth. Out of the dozen tubes of mascara I have it's my favorite. I've gotten a few of my friends to pick it up and they loved it too so maybe it's a bad tube? But that green is gorgeous, I hated Aztec Gold on me but now I regret getting rid of it! Beautiful look! And for the record, I HATE the Falsies mascara. It's ridiculous. Perfect look for the World Cup! I have been absolutely loving your make up posts lately. :) Thanks so much for posting them. I'd love to see some more looks with the Kat Von D pallets you own (other than Adora) or Urban decay shadows. I have no idea what Falsies mascara is, or what the problem is with it. But now I'm totally intrigued and can't wait to see. Thanks for the inspiration. Your eyes always look beautiful. 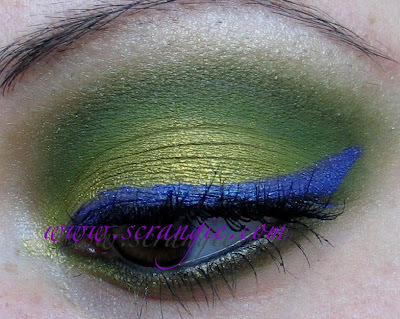 Love the green in the crease! So lovely. I'm actually looking forward to seeing your Falsies pictures because so many people tell me they love the mascara, but I've seen a lot of not so hot reviews. 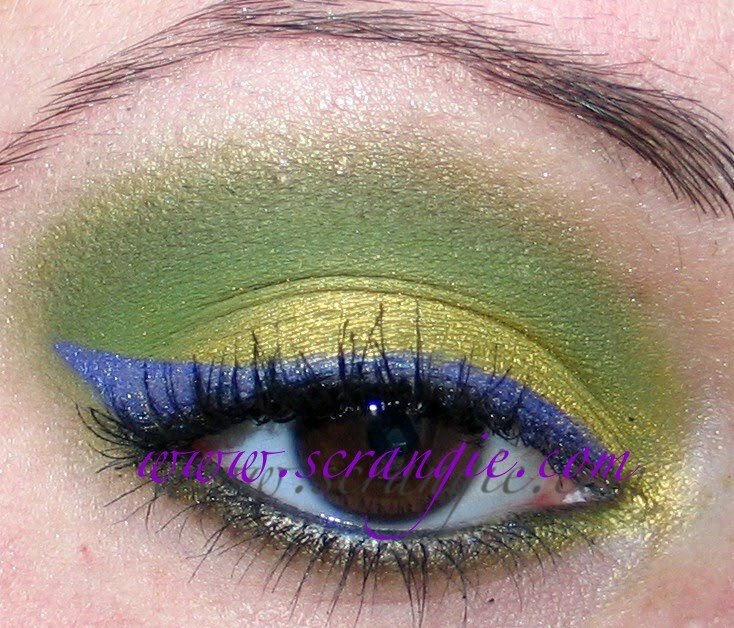 I have to try the combination of green and purple. I like it!